This strapless romper flatters any bust with her flair and panache. This romper features an elastic lined bust and waist.Great with slides, strappy sandals or over the knee boots, this romper can be worn all day and in any way! The Santa Rosa Romper is one of the cutest styles in our spring line up. It features ruffle detailing, front pockets, and a zipper at the back. Half overall and half romper, get the best of both with this super sweet style. 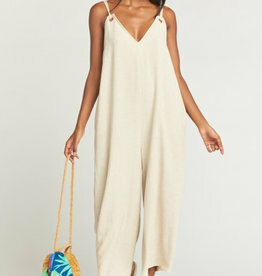 An oh so comfy and boho jumpsuit. This jumpsuit features a v-cut neck and two side pockets. Pair this jumpsuit with your favorite slides and woven bag and you'll be looking vacay chic! The perfect pastel dress! This dress features adjustable straps, button down closures and a v-cut neck and back. Pair this dress with you fave sneakers or wedges to take your look from the boardwalk to brunch!